We’ll get into his eye-popping offensive numbers directly, but one figure that might’ve gotten overlooked this season is 81 – the amount of games Clarkson suited up for in a campaign in which injuries crippled the club. If not for Collin Sexton – who became first Cavs' rookie since Andre Miller to suit up for all 82 contests – Clarkson would be the squad’s most durable player. And that’s simply another reason coaches, teammates and fans love the well-inked 2-guard – he’s averaged 81 games per year over his last four seasons. It seems like Lou Williams, Eric Gordon or Jamal Crawford have won every Sixth Man award since the days of Detlef Schrempf – and Sweet Lou should take home the hardware again this year – leading all bench scorers (and the 6th-seeded Clippers) with an even 20.0 ppg average, tallying a league-leading 1,485 points in the process. 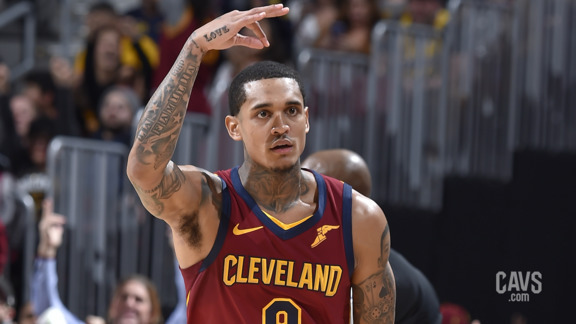 Clarkson finished third in scoring among all NBA reserves this season – averaging 16.8 points per, .2 behind the Cavs’ leading scorer, Kevin Love, and .1 better than Sexton, the team’s third-best. Despite not starting a single game for Cleveland, he still led the squad in scoring on a team-best 28 occasions. Coming into Training Camp – and coming off a strong performance with his Philippines team in the Asian Games last summer – Clarkson was hellbent on erasing the memory of his subpar performance in the previous year’s Playoffs, struggling mightily (4.1 ppg on 30 percent shooting) in his career postseason debut. He did exactly that – leading all bench players, notching double-figures in 72 of his 81 appearances. He surpassed Campy Russell as the franchise’s single-season points leader for a reserve and his scoring average is second all-time, trailing the legendary Hot Rod Williams by a fraction of a point. Clarkson’s directive this year was clear – to score the ball without conscience off the bench. He posted 25 games of at least 20 points, including a pair of three-game runs of at least 20. But Clarkson – who also shot .844 from the stripe – still averaged 3.3 boards and 2.4 assists – leading the team 11 times this year in helpers, 17 times in steals and, in blocks, on 10 occasions. The soft-spoken San Antonio native was the main reason Cleveland’s bench ranked 6th in league this season and set a new franchise mark (breaking last year’s record) – averaging 42.6 points per. In 2018-19, the Cavs' second unit combined for at least 40 points in 50 games, 50+ 20 times, 60+ five times, more than 70 twice and an 83-point outburst in a triple-overtime thriller against Brooklyn (with Clarkson scoring more than half of those). Clarkson had a season off the bench that ranked with some of the franchise's all-time great reserves -- from Campy Russell to Hot Rod Williams. Highlight Heading into the final game before the All-Star Break, no Cavalier had topped the 30-point plateau. Clarkson took care of that – putting on an awesome scoring display in the triple-OT classic. Clarkson had 18 points through the first three quarters, but began heating up down the stretch and proceeded to score eight points in the fourth and 18 more over the next three extra sessions – including 11 in the final OT period. On the night, Clarkson went 16-for-34 from the floor, including 7-of-17 from beyond the arc, adding eight boards, five assists, a steal and a block. His 42 points are an all-time scoring record for a Cavalier reserve – topping Phil Hubbard’s mark of 37 back in December 1984 – and also the high-water mark for both Clarkson and the squad this season. Lowlight -- When you play in 81 games and tally double-figure scoring in 72 of them, there really aren’t a bunch of lowlights to choose from. We can start with the game he missed – perhaps the most thrilling road victory of the season, a December 18 outing in Indiana. A sore lower back kept Clarkson out of the lineup and out of the celebration as Larry Nance Jr. scored on a tip-in at the buzzer for the 92-91 win. Clarkson didn’t have many clunkers during the year, but he did struggle against the team he grew up rooting for – the San Antonio Spurs – in the penultimate game of the regular season at The Q (now Rocket Mortgage FieldHouse). In that contest – the first game following a nine-day roadie – Clarkson was simply out of gas, finishing with two points, no assists and no rebounds, going 1-of-8 from the floor, including 0-of-4 from long-range. If anyone deserved the mulligan, it was Clarkson, who essentially left everything on the floor in the final four games of the late-season trip – averaging 19.5 points per on 53 percent shooting as Cleveland wrapped up its road schedule. Odds and Ends -- Jordan Clarkson has an artistic flair on the floor, and this season he adapted some pretty elaborate ink. When last year’s postseason ended, Clarkson was tattoo-free. But he began getting work early in the offseason and continued adding body art all year long. He explained some of the early work. ”My neck is a full thing that goes through my chest and that's why the roses are there -- the beautiful part. And then the roots where my grandma and my great-grandma are all gonna be on my chest. By the Numbers 1,364 ... points that Jordan Clarkson has scored in a reserve role this season – just the 19th time in NBA history that a player has tallied at least 1,300 points off the bench. On March 22, when he scored his 10th point against the Clippers, Clarkson passed Campy Russell (1975-76) for the most points by a Cavs reserve in a single season. Looking Forward After an outstanding first full year with the Wine & Gold, Clarkson will play for his third head coach in Cleveland this upcoming season. It’d be hard to imagine the new coach or Clarkson asking for a change of roles. This season, Clarkson established himself as one of the Association’s premier sixth men and as the Cavaliers’ most consistent offensive weapon. Clarkson has so many of the qualities every NBA team covets. He’s a solid locker room guy. He’s content with any role but has accepted and flourished in his current one. He brings the same game almost every night and he’s extremely durable. This past season was filled with ups and downs for most of the Cavaliers. Clarkson clipped along at a high level all year long and there’s no reason to think that’ll change in 2019-20.